Pontypridd Poor Law Union was formed on 27th December, 1862, from outlying areas of the existing Unions of Cardiff (parishes of Eglwysilan, Llantrisaint and Llantwit Vairdre) and MerthyrTydfil (Ystradyfodwg, Llanwonno and Llanfabon). Its operation was overseen by a 25-strong Board of Guardians: 6 from Llanwonno, 5 from Llantrisaint, 4 each from Eglwysilan, Llantwit Vairdre and Ystradyfodwg, and 2 from Llanfabon. The total population of the union at the 1861 census had been 30,827. 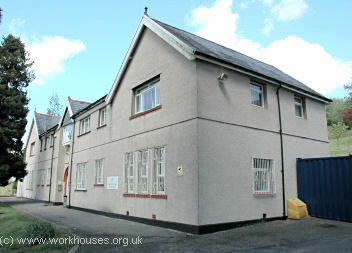 A new Pontypridd workhouse was erected in 1865 at the south side of Court House Street, between Albert Road and the High Street. It was designed by GE Robinson of Cardiff and its construction cost around £7,000. The original building was a T-shaped block with its entrance facing to the north. By 1900, the workhouse had greatly expanded to the southwest with the erection of an infirmary and isolation hospital, together with further blocks along the High Street. The main building was also enlarged. A directory of 1895 described the workhouse as "a large and substantial building" for 314 inmates. The Union also erected offices opposite the workhouse entrance on Court House Street. The extended site layout is shown on the 1921 map below. The workhouse later became known as Central Homes and then under the National Health Service as Graig Hospital for the chronic sick. 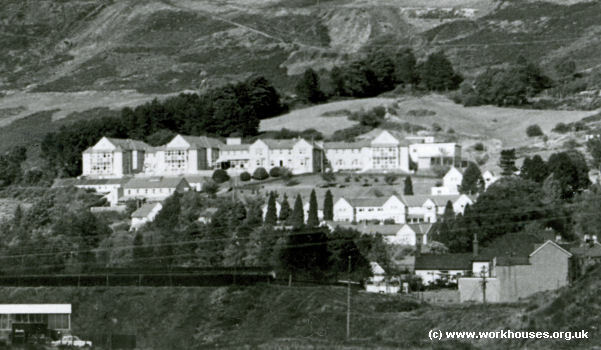 The original buildings were demolished in the mid-1960s and a new hospital (Dewi Sant) was built on the site. 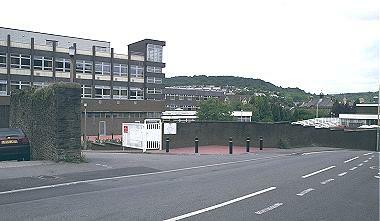 Pontypridd former workhouse site, 2000. For children under the age of five, the Pontypridd Union established the Maes-Y-Coed Homes on Maes-Y-Coed Road, located about a third of a mile to the north-west of the workhouse. In 1892, cottage homes were built for older children at Church Village, Llantwit Vardre. The homes were arranged around a "village green". The site location and layout are shown on the 1921 map below. Pontypridd cottage homes site, 1921. Llantwit Vardre Cottage Homes from the south-east, c.1904. The homes have now all been demolished. 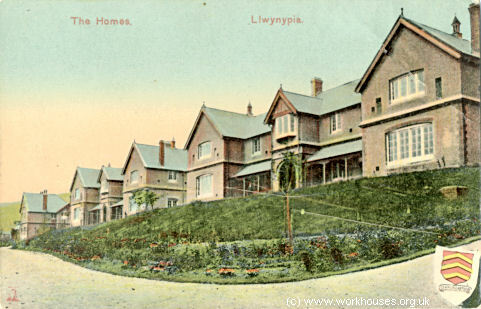 In 1903, a subsidiary workhouse, known as the Llwynypia Homes, was built at Llwynypia in the Rhondda. Its location and layout are shown on the 1921 map below. 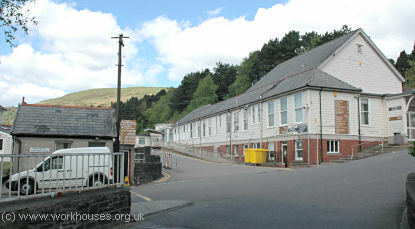 Pontypridd Llwynypia site from the south-west, date unknown. An infirmary was added in 1909. This site became Llwynypia Hospital in 1927. Pontypridd Llwynypia 1909 infirmary buildings, 2005. 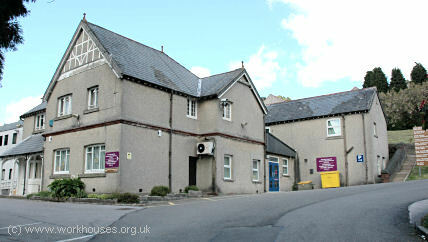 Llwynypia Hospital still operates on the site. Guardians' minute books (1863-74, 1882-1930). Llwynypia Workhouse: Creed Registers (1903-31); Births (1914-33). Cottage Homes: Admission and discharges (1892-1955); Creed registers (1892-1944); Deaths (1895-1920); Cottage Homes Committee minutes (1892-1909).